Health / Nutrition / What’s Wrong with Fructose? Highly concentrated dietary fructose is a major problem, and major corporations put it everywhere. Here’s what you need to know to prevent health problems. I am routinely indebted to Dr. Mercola‘s work — in this case, to his clear explanation of the kinds of sugars that are present in the American diet. His pages, along with Dr. Lustig’s exceptional lecture, are the primary sources for the information in this article. It could not be more clear that American corporations are running out of control. No sooner does the public become aware of one dietary danger than the industry creates ten more. In this case, the danger is highly concentrated dietary fructose. Despite solid scientific evidence of it’s deadly effects, the industry is packaging it in ever more concentrated forms (HFCS and crystalline fructose), and even selling it to you as “healthy” (many forms of Agave syrup). Can the FDA or USDA Do Anything? As Dr. Mercola writes, “too much fructose creates a metabolic disaster in your body”. In his YouTube lecture, Dr. Lustig goes one further: “Fructose is a poison”. 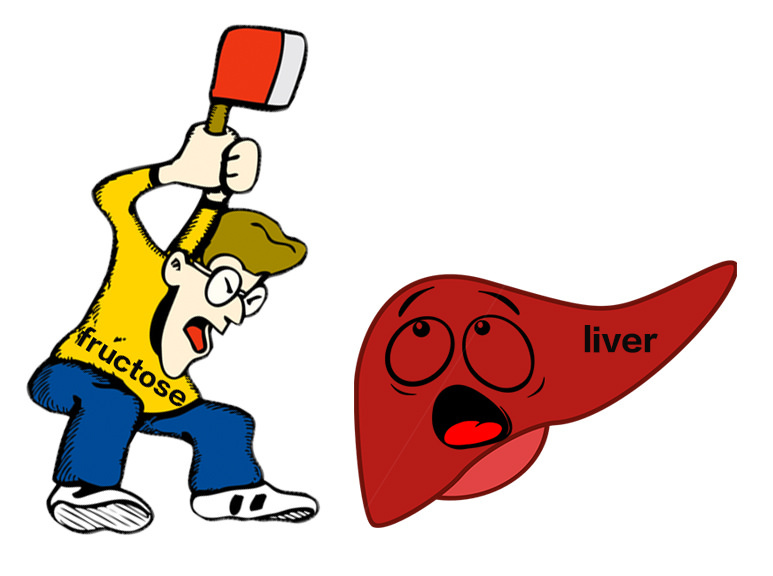 Unbound fructose goes straight to the liver, which has to process it. And since unbound fructose is contained in virtually every soft drink and processed food we consume, we get a lot of it. Fructose feeds the bacteria that cause gastric distress. So you’ve having a problem with indigestion, you’ll want to eliminate sources of concentrated fructose from your diet. Fructose is converted to fat and cholesterol. A lot of it is converted to uric acid — breaking down ATP to do it. That’s a double whammy, because the ATP can no longer be burned for energy (reducing liver function), and because uric acid has harmful consequences of it’s own. That process also leads to inflammation. Some gets converted to ATP (energy). 30% is converted to VLDL. That’s the dangerous lipoprotein that becomes arterial plaque (other forms of LDL don’t). What doesn’t become plaque is stored as fat. Some of the fructose escapes as free fatty acids, which causes insulin resistance in muscle tissue. Some remains in the liver as harmful fatty acid deposits. In fact, 30% of fructose is converted to fat. With glucose, on the other hand, virtually none is stored as fat. Insulin from the pancreas suppresses ghrelin, the appetite hormone secreted by the stomach, so you’re less hungry. Leptin generated by fat cells tells your brain that you’ve taken in all you can handle. If the meal has sufficient fiber, the PYY hormone released by the ileum (intestine) tells your brain that you’re full. Together, grhelin, leptin, and PYY regulate how much you eat, and how much you weigh. Highly concentrated fructose knocks out two of the three. If you’re getting in a food without much fiber (think soda and fast foods), then you have no governor at all on your appetite. Worse, fructose tells your brain that you’re starving, and increases your appetite. A published study suggests that the consumption of high amounts of fructose causes leptin resistance and elevated triglycerides…. (The subjects) ate more and gained more weight than controls fed a high fat, high calorie diet. Learn more:Leptin: What is It and Why Should We Care? Fructose elevates uric acid, which raises blood pressure, damages your kidneys, and leads to chronic, low-level inflammation. As Dr. Lustig points out, a can of soda is virtually equivalent to a can of beer. It has the same number of calories, and is metabolized in the liver in the same way. So kids get “soda belly”. Fructose elevates triglycerides, blood sugar, and blood pressure. Because of the high volume of fats created in the liver, fructose can produce NAFLD (non-alcoholic fatty liver disease). There is exactly one time when fructose is helpful. After extreme exercise (like a marathon), when glycogen is completely depleted, fructose causes glycogen stores to be rebuilt more rapidly. So fruit and even sugar makes sense after severe, extreme exercise. Exercise speeds up the metabolism, which causes more of the fructose to get converted to energy, rather than being converted to VLDL cholesterol and free fatty acids. It also lowers stress, which reduces appetite. Fiber slows the digestive process, so fructose arrives at the liver little by little, instead of all at once. The slower arrival rate also means that more of it is converted to energy. Raw honey is 53% fructose, but it contains enzymes, minerals, and as many anti-oxidants as spinach. Fruit has high levels of fructose, but it’s combined with fiber, plus enzymes, vitamins, and minerals. Sucrose (table sugar) is 50% fructose and 50% glucose. They’re bound together, one-for-one, in the sucrose molecule. That molecule is readily split during digestion, but with the glucose stimulating the production of both insulin and leptin, there is at least some kind of limit on how much you’re hungry for. Maple sugar is 50% fructose. Basically the same as table sugar — while not 100% healthy, it’s a combination your body can handle, and something we’ve had for thousands of years. Starch breaks down to glucose — not fructose. Stevia and Lo Han contain no fructose. No glucose, either. Somehow, they manage to taste sweet without having any sugar at all (and therefore, virtually no calories). Quite a trick. Stevia has an aftertaste though. Need to try Lo Han. Clearly, the real danger lies in highly concentrated doses of fructose. But think we’re in the clear? Think again. The industry has been hard at work finding new better ways to produce poisons for profit. The two newest are Crystalline Fructose and Agave Syrup. Agave is heavily promoted as a low glycemic food, enticing diabetics. Fully chemically processed sap from the agave plant is known as hydrolyzed high fructose inulin syrup. Agave syrup is not a live food. The natural enzymes are removed to prevent agave syrup from fermenting. Agave is, for all intents and purposes, highly concentrated sugar. Sugar and sweeteners wreak havoc on your health and are highly addictive. The alleged benefit of agave for diabetics is purely speculative. Very few agave studies have been documented. Agave syrup can be anywhere from 55 percent to 90 percent fructose. Given the high percentage of fructose, many Agave syrups are simply a high-fructose syrup (HFS) made from agave, instead of from corn (HFAS, instead of HFCS). And it’s being sold as a healthy alternative. Reading from the FDA charter, Dr. Lustig points out that the FDA has a mandate to regulate acute poisons (those that cause immediate harm), but not chronic poisons (those that cause long term harm), even when the FDA knows for a fact that the substances do in fact, produce chronic obesity and disease. In other words, according to the FDA charter — a charter that is determined by our legislators, who are pretty much at the whim of corporate lobbyists — the FDA can do nothing at all. The USDA, meanwhile, does nothing, because declaring our foods bad would make it impossible to export American “food” products. There is no doubt whatever that American corporations play fast and loose with the facts. Despite years of documented studies on the effects of fructose, and despite the industrial high-heat processes that are used to make Agave syrup, it is marketed as a “natural”, “healthy” alternative to sugar. In short, anyone who has devoted themselves to avoiding HFCS and other egregious substances in American foods has been gulled into ingesting the exact same substance under another name. So here I am, writing yet another article on something in the American food supply that you need to avoid to stay healthy. Nothing makes me madder than a nutritional poison that purports to be healthy. But American corporations will do anything and everything they can get away with, for the sake of profit. According to the insidious mantra of “personal responsibility”, it’s up to you to avoid the crap they’re selling. Well, take responsibility. Write your representatives to legislate against the ingredients those companies use. Tell them to impose punitive taxation on people who sell poisons for profit. Make the taxes retroactive, to pay for the harm they have already caused. Tax the past earnings of the executives who made the decisions, by way of civil suit if in no other way. And then put the criminals out of business. Dr. Robert Lustig’s lecture (University of California, San Francisco), clearly describes the exact metabolic pathways by which fructose produces insulin resistance, generates uric acid, and turns into cholesterol and fat. Register to read the articles at the Mercola site. You’ll be glad you did. Leptin: What is It and Why Should We Care?